Corsair is currently the number one brand in PC power supply units in North America, hands down. While they are getting challenged on this front by a number of other brands like be quiet! and others, Corsair continues to push the boundaries of quality higher. And with their latest product, they hold absolutely nothing back. Introducing, the new Corsair AX1500i 80+ Titanium all digital fully modular PSU. You can probably already tell that the AX1500i is in a class all its own. At least for the time being. This unit is designed to output up to 1500 watts of power (up to 450 watts before the 140 mm fan turns ON), comes with full support for the Corsair Link Monitoring software, and can hand a quad-GPU system all by itself. The Corsair Link system has even been updated to allow for per-rail control of the over-current protection points and switch from single to multi-rail 12V outputs. The Corsair AX1500i is possibly the most technologically advanced power supply ever built for a PC. If the 94% efficiency at 50% load, insane power output, or dynamic user controls don't impress you, then maybe the $449.99 MSRP price tag will. The AX1500i is set to be available in Q2 2014. 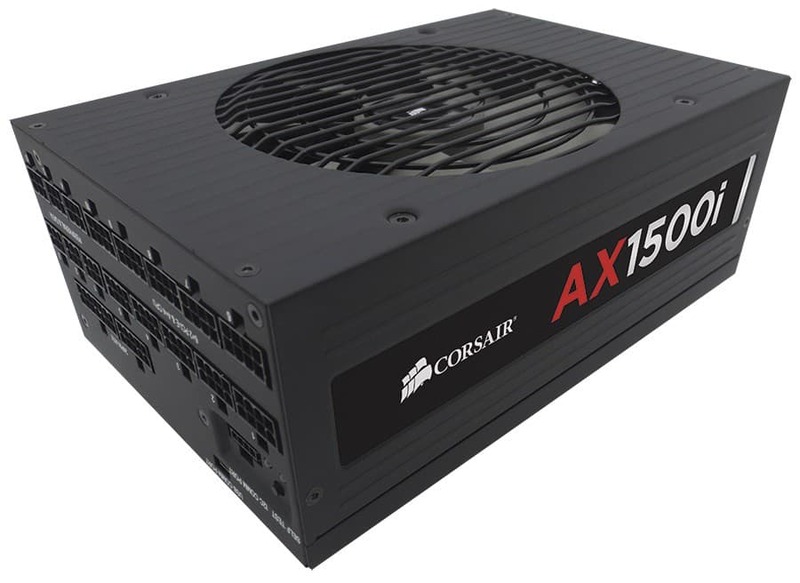 January 7, 2014 — Corsair®, the most awarded PC power supply brand in the world, today announced the AX1500i Digital ATX power supply. The PSU’s digitally-controlled circuitry delivers 1500 watts of ultra-stable power with efficiency that goes beyond 80 PLUS Platinum, making the AX1500i the most technologically advanced, energy-efficient, and customizable power supply available for extreme PC enthusiasts. The AX1500i’s groundbreaking efficiency meets the current draft for ATX 115 Volt 80 PLUS Titanium for consumer PSUs. The AX1500i's second generation digital architecture enables the PSU to consistently deliver up to 1500 watts of power with class-leading Titanium energy efficiency levels of up to 94%. The DSP-controlled circuitry of the PSU allows it to consistently deliver exceptionally stable voltages along with amazingly low ripple and noise. Tremendous power reserves combined with a vast array of cabling options enables the AX1500i to power heavily overclocked PC systems with up to four graphics cards in NVIDIA® SLI™ or AMD CrossFireX™ configurations with headroom to spare. The AX1500i’s leading performance is possible thanks to a streamlined component count and circuit-board layout made possible by the DSP-based design. The AX1500i’s high efficiency results in reduced heat, allowing the PSU to operate in silent Zero RPM Fan Mode until the load reaches 450 watts. A custom-designed fluid dynamic bearing 140 mm fan, specifically designed for low-noise operation, allows the PSU to run quietly even when running at full 1500 watt power output. AX1500i's DSP-based design, combined with Corsair Link™ technology, gives enthusiasts unprecedented control over the features and performance characteristics of their PSU. This includes real-time monitoring of temperature, current draw, and power efficiency, as well as the ability to adjust the speed of the internal 140 mm fan. These features also allow for a unique level of customization, including the ability to set over-current protection points on a per-rail basis in the default multi-rail +12V configuration or simply switch to single +12V rail mode. The AX1500i Digital ATX Power Supply is backed by a seven-year warranty and will be available in Q2 from Corsair's worldwide network of authorized retailers and distributors. The suggested US retail price is $449.99 USD.